Just wanted to say hello and at last introduce myself. I was so excited when Michael kindly invited me to join the BWR team a couple of weeks ago and I must send a huge apology for or my delay with my introduction. I am a bit rubbish with the whole computer thing. I just don’t go on them very often but I will endeavour to be better and make the effort. My name is mandi and I am married to Sheldon, a fellow BWR. Sheldon and I live in the UK with our mad English springer spaniel dog, in an area known as the Cotswolds, which is about an 1 hour away from Birmingham. It is a great place to ride our bikes. I only started riding a bike when I met Sheldon. I didn’t see him very much and so I decided I would join him on a bike ride one day and never looked back. It is now me that pesters him to go out! 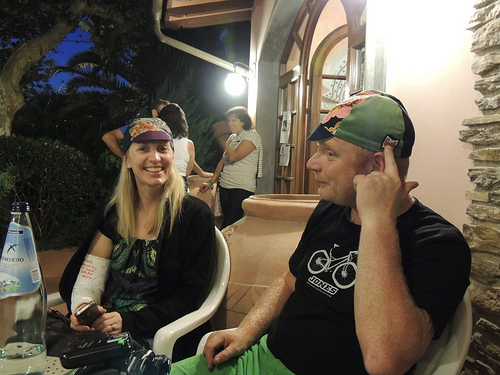 Unfortunately this summer in Italy I fell off my bike and dislocated my right elbow. I am now riding my turbo for most of the winter until I have completed a physio course. So I am not sure which races I will be entering in the early part of next year, but I will keep you posted. There was a question regarding why we wanted to be part of a team. I see it as being part of a family of like-minded people who are there also to help, support and encourage each other, in what ever way we can. I really look forward to meeting the rest of the team at some point. Take care all of you when out on your bike!